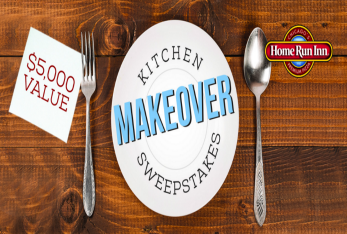 Home Run Inn Kitchen Makeover Sweepstakes – Win $5,000! ENTRY LIMIT – Unlimited entries are allowed. ELIGIBILITY – To enter the Home Run Inn Kitchen Makeover, as of the entry date you must be eighteen (18) years of age or older, a legal U.S. resident. SWEEPSTAKES ENTRY PERIOD – Sweepstakes begins at 12:00:00 a.m. Central Standard Time (“CST”) on February 15, 2016 and ends at 11:59:59 p.m. CST on May 30, 2016. PRIZES – One (1) winner will receive $5,000.